When a meteor crashes to earth in the ancient past, Japanese monks use it to fashion a magical, glowing sword. 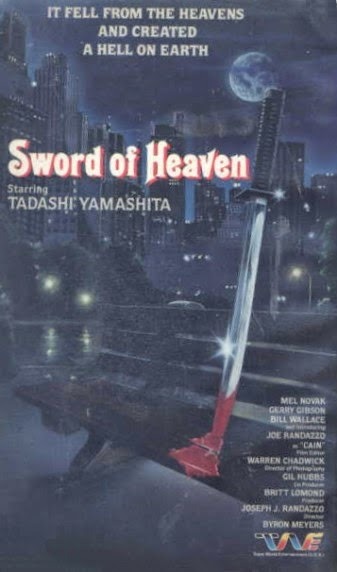 Now, in present-day Los Angeles, a cop named Tadashi (Yamashita) and his very Irish partner Patrick (Gibson) are fighting not only police corruption, a sadistic pimp named Cain (Randazzo) and a paramilitary group led by camp commander Dirk St. John (Novak), but Tadashi agrees to try and find the missing sword and return it back to its rightful owner, because it has been in his family for centuries. Not only that, but the daughter of the sword’s owner, Satoko (Mika), has been kidnapped. It sure looks like there’s a lot on Patrick and Tadashi’s plate, but luckily Tadashi “Is the best the Japanese have to offer” and he can “handle any weapon ever made”. Does that include the...SWORD OF HEAVEN? We absolutely loved Sword of Heaven. It has that funny, insane, yet unwittingly (?) wacky sensibility we enjoy so much. It has one of the best openings we’ve seen in a while, as Tadashi tears around the desert, popping wheelies on his motorbike - this after we actually see the materials for the sword coming out of space hundreds of years ago! The music that accompanies these scenes and many others is triumphant and Superman-like, and the rest of the score is extremely catchy as well. There’s even a song during a chase that sounds a LOT like ZZ Top’s “Legs”. The music, like the movie itself, is upbeat and fast paced. While it may seem impressive that genre stalwarts Karen Sheperd, Bill “Superfoot” Wallace and Gerald Okamura have joined Tadashi, you truly haven’t lived until you’ve seen Tadashi Yamashita - who looks like a Japanese Mitt Romney - executing his Martial Arts moves while (needlessly, which makes it funny) going undercover in a red dress. This when not on his awesome motorbike with a sword strapped to his back. His most noteworthy nemesis, in a movie full of them, is Joe Randazzo as Cain. He wears one glove like Michael Jackson and puts in an over-the-top, bonkers performance that on the John Miller scale of acting, rates about a 6.5 to a 7. There’s the token barfight (check out the pinball machines), absurd 80’s insults are thrown around, and even though the kidnapped girl’s name is Satoko, it REALLY sounds like all the characters are calling her “Sudoku”. For half the movie we thought Tadashi really loved seeking out challenging number puzzles. But even though the movie is slathered in the loony goings-on you just have to love, there’s plenty of great action and stunts as well, so the action side of our brains is fully satisfied. There’s even a classic “hero goes in the woods and proceeds to kill goons” ending, each with different weaponry, which shows the movie’s heart was in the right place all along. During the infamous nightclub scene, a metal band is on stage called Ninja Warriors of Rock, playing a song called “War of Love”. 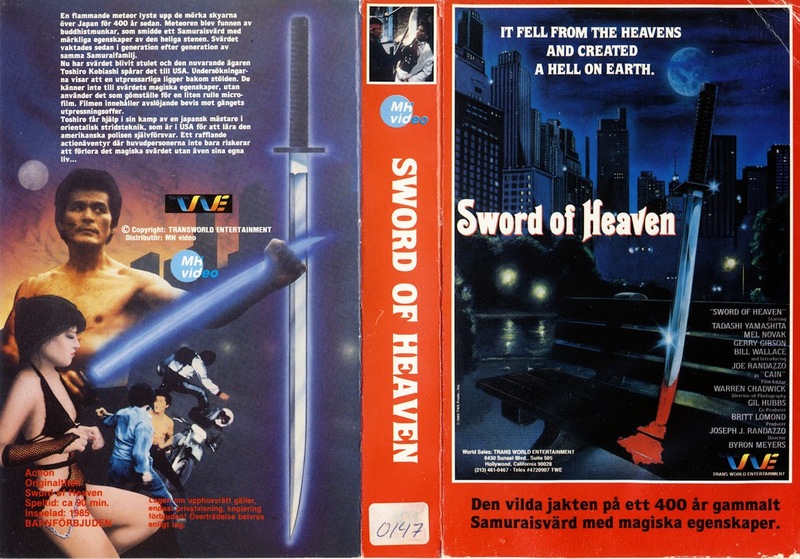 Released on VHS by TransWorld, do yourself a favor and see Sword of Heaven! I'm not surprised this movie is great, since it was written by James Bruner. He also wrote Missing In Action, Braddock and Invasion USA. After reading your review, I have to put in on my watch list. Ninja Warriors of Rock? SOLD. Roger: Looking forward to your opinion, buddy! He wrote some classics. Snake: Haha. The greatest Ninja-related band since Dragon Sound from Miami Connection. The name of the band is The Ninja, and they released the album called Warriors of Rock. My wife and I wrote the song Ninja did in the movie. Now I want to see it! That's great! Any interesting stories on how the song was in the movie? Fun action flick by the way.